I imagine most of my readers are educated enough to recognize that this is some kind of probability distribution and that it's shifting over time - but probability distribution of what? Well, take the temperature in a 250km by 250km cell of the earth's surface and compute the average for each summer (the months of June, July, and August). Obviously, some summers are warmer than others so these summer averages will fluctuate, but on the whole we expect summers to have been getting warmer in most places on account of global warming. 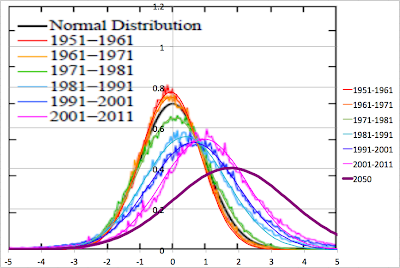 To explore how these trends are changing what Hansen et al do is find the mean and standard deviation for each cell from 1951 to 1980 and use that to rescale all the individual summer averages. 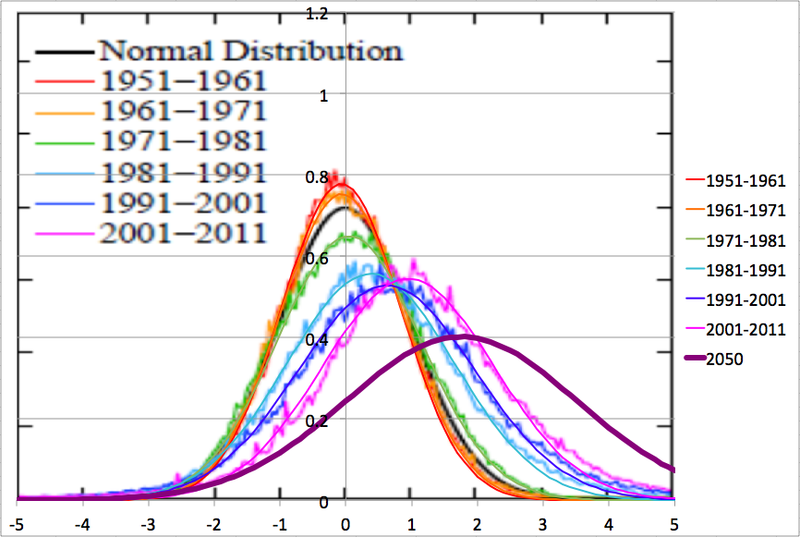 That makes the entire global population of cell-summers comparable (in the sense that they have the same average and width of distribution over 1951-1980 after rescaling) so they combine all the summers from all the cells and compute the histograms by decade. That's the result above. 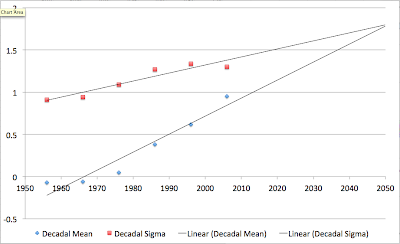 So the way to read the x-axis scale is that "-2" say is a summer that would be "two sigmas" below the average summer for a particular location and would thus be an unusually cool summer that we would only expect to occur in a few percent of years (assuming the 1951-1980 climate), while a "+3" is an extremely hot summer that would likely be hotter than any summer in living memory (again, assuming a stationary climate like that of 1951-1980). 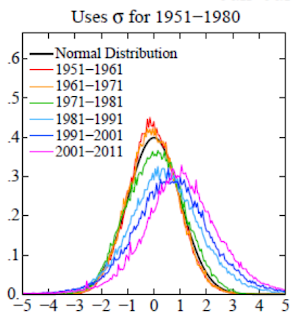 So, as we would expect, the distributions shift to the right over time - in the 2000s, an average summer would have been a "+1" - one sigma above the mean - in 1951-1980. However, the really eye opening thing is that the distributions are not just shifting to the right but also getting broader - by a lot. What that means is that the probability of extremely hot scorching summers is getting bigger much faster than we'd expect just from the shift in the mean temperature. The globe is not just getting warmer, it's also getting more variable in temperature at the same time and this increase in variability is really noticeable. For those of us over about 40, you can basically think of the baseline period 1951-1980 as "like my childhood". So then a "+2" would be roughly "hottest summer in my childhood". A "+3" would be "a summer that would have been the hottest in living memory - almost inconceivably hot in the climate I grew up in". But by the 2000s, such a summer would occur in about 10% of the years in that same location (This is the global average chance - some places have done better, others worse. You'll have to make the obvious corrections if you've moved around). You can see that the distribution is getting broader at about half the rate that it's moving rightwards (ie to the hot). You can see my fits to Hansen et al's data as the thin lines, but the main point of the figure is the heavy plum colored line which is my 2050 extrapolation. So this is what to expect by mid century if recent trends continue. There's no guarantee that they will of course, but it's probably a better guess than anything else. And if they do, we are looking at the average summer being almost a "+2" on the 1951-1980 scale. And the "+3" "hotter than living memory" type events will be occurring around 1 year in 4 or so. And "+4" and "+5" events that would have been completely inconceivable will be happening often enough to notice - you'll likely experience a "+4" summer for your climate and, at a minimum, you'll be reading about the "+5" events in the news if you are lucky enough not to experience one. This does not mean that every summer will be a killer summer. The broadening of the distribution means that it's still possible to very occasionally get to very cool "-2" summers. 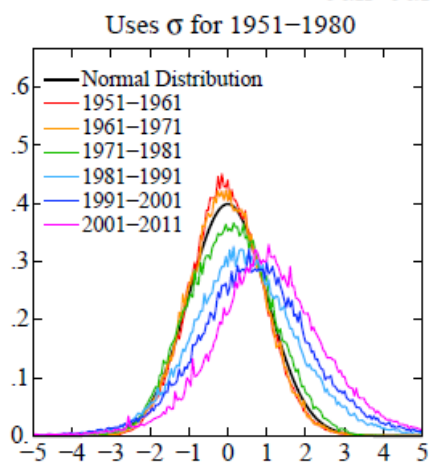 A "cooler than average" summer in the 1951-1980 distribution will become a 1 in 5 event in 2050 rather than a 1 in 2 event - but they won't stop altogether. Still, under these circumstances, it's perhaps not surprising that PDSI projections are saying there will be a lot more drought. Nothing is going to be the same. Unfortunately, there are many climatologists (e.g. in the Czech Republic) and some of them I know personally, who regard Hansen's opinions as "alarmist", and others think we will simply "adapt" to climate change. Thanks for this Stewart. I too was following yesterday's discussion and saw the flatter distribution. Another unhappy consequence of this higher variability is that it probably will preclude farmers in more northerly locations from trying to adjust and take advantage of their now warmer weather. That is, dare a New England farmer attempt to grow peanuts, now that his/her growing season is longer, or dare a north Florida or even a Georgia farmer plant oranges? I highly doubt it for although on average, such locations might see a now longer growing season, along with higher average temperatures, the flatter distribution still allows for colder weather to wipe out plantings. That is, farmers can count on a higher probability of warmer weather, but can't count on an absence of colder, destructive weather, even if the probability of the colder weather is somewhat less than before. It still would wipe out plantings. Stephen B: It's a key issue - clearly the increase in variability is a much bigger problem for agriculture than slow changes in the mean climate. Especially when we posit it probably extends to agricultural drought as well as temperature per-se. What is the standard deviation in degrees c (or F) for this chart? Now the chart moves a degree to the right by 2050. 1 c = 1.8 degrees F, call it two for arguments sake. As nearly as I can tell the actual value of the standard deviation isn't mentioned. Assuming it is 1 degree c, again I'll call that 1.8 F.
Is there something I have missed with all this? I've rounded up on the conversion, and assumed the original work was in degrees C as well.